On any given year, there are approximately 136 million visits to the emergency room and 41 percent of the population will seek out emergency room treatment. 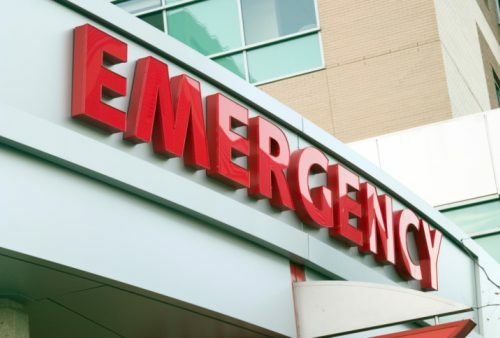 Although the ER often conjures up images of dramatic life or death situations such as bullet wounds or other bodily injuries, the majority of ER visits are not caused by injuries — they are caused by health or pain related issues. Below are the most common conditions found in the ER. Heart disease is the leading cause of death in the United States and chest or heart pain can indicate a potentially life threatening heart attack. Given these two facts, it is no surprise that chest and heart pain are two of the most commonly treated symptoms in the emergency room. Although chest pain may just be a symptom of indigestion, if you experience burning or intense pressure in your chest or heart area, in conjunction with sweating, nausea or shortness of breath, you should seek medical treatment right away. Although heart pain may seem like a more pressing matter, back pain is actually a leading cause of emergency room visits. Back pain may develop gradually, and it can be caused by lifting something or sleeping the wrong way, daily activities, or a lack of muscle strength. In these instances, emergency room treatment is probably not warranted, and either giving your body time to heal or a visit with your regular physician will suffice. On the other hand, severe back pain caused by an accident (such as a fall or blow to your back), or back pain that is constant or intense and/or accompanied by new bowel or bladder problems, fever, pain or throbbing in your stomach, numbness or weakness in your legs, or swelling or redness of your back may indicate a serious medical condition. According to the National Health Statistics Reports, one of the leading causes of visits to the emergency room is stomach pain. Although stomach pain may result from something as benign as improper digestion, it can also be a sign of something much more serious. If your stomach pain is accompanied by unrelenting nausea, and/or uncontrollable vomiting you may have food poisoning and should seek treatment at the emergency room. Stomach pain that is accompanied by blood in the urine, fever and chills, nausea or severe pain, may be a sign of kidney stones, and also warrants a trip to the emergency room. An upper respiratory tract infection, such as the common cold, is a viral infection that affects the nose, sinus, larynx or pharynx. It is a common sickness in the ER and the most common reason for an emergency room visit amongst children aged 15 and under. Symptoms such as a runny or stuffy nose, cough, congestion, mild fatigue and low grade fever are normal and do not usually require medical attention. However, if you or your child experience significantly swollen glands, severe sinus pain, colored phlegm, or a fever of 103 or higher (or 102 for infants and toddlers), medical treatment is advisable. Although the majority of emergency room visits are health and pain related, injuries such as broken bones and sprains are also dealt with in the ER. According to Mayo Clinic, most sprains do not necessitate ER treatment however, and they can be taken care of in a non-emergency room medical setting, such as an urgent care unit. Broken bones, on the other hand, are a serious matter and they require emergency treatment.